Hi folks! Today, I’m going to spotlight an addon recently profiled by the always effervescent Nibuca, of Mystic Chicanery. 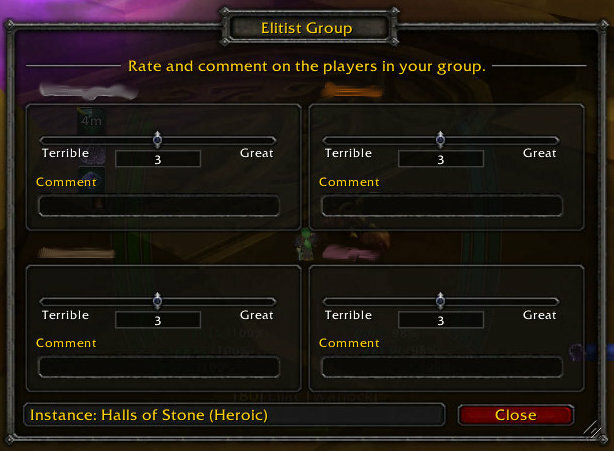 Elitist Group is an unfortunately named addon that gives you information about the members of your group. Specifically, it gives you a short summary of various character metrics, as well as lets you write yourself notes about people. Note that there’s an easy to understand check or X beside various entries for each character. You can earn an X by doing things like mis-enchanting your gear or rocking your resilience set in a heroic. While I am not a huge fan of automated character judgment, I find that there is some value in knowing what you are working with before you start. It may change your play-style. This would automate something I think a lot of people do already- keeping a list of people so terrible (attitude, skill, whatever) you aren’t interested in playing with them, but not so terrible that you’re willing to add them to your ignore list. It would also add something I think we should all do- keep a list of awesome people. 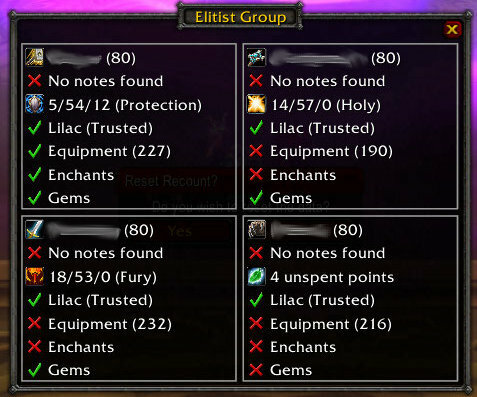 The resource site spotlight (aka wiki tiki utility posts) should happen every week, but is written by Euripides from outdps.com and the Hunting Party Podcast, and endeavors to fill your favorites bar with an unmanageably large quantity of WOW resource sites. So much knowledge that it hurts. Ow. Ow. Ow. Ow.